This is a rectangular Mobiloil Authorized Service porcelain sign. This particular Mobiloil Authorized Service sign is predominantly white with black text and an orange creature in the center. 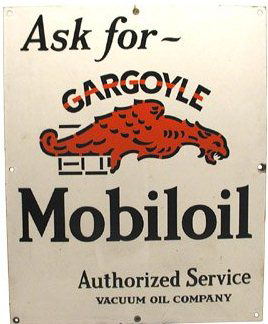 It reads, “Ask for Gargoyle Mobiloil Authorized Service, Vacuum Oil Company.